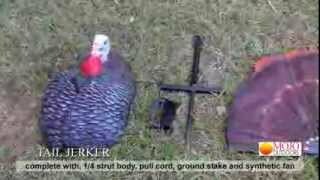 The MOJO Tail Jerker is essentially a pull string operated jake style turkey decoy with approximately one-fourth of the front of the body that raises and lowers a fanned tail designed specifically for those areas that do not allow motorized decoys, or just for those who want lighter, more portable and cost effective decoys. Turkeys are famous for their eyesight, especially their ability to detect movement, thus they will see this decoy from a long way off. Long beards will not tolerate such jakes in their territory and will come to run them off. Especially effective when combined with one or more hen decoys. Comes with a realistic silk fan plus specially designed hub that allows hunter to use a real turkey tail (fan) for ultimate realism. Complete with 50 feet of pull cord, a specially designed pull handle that doubles as a storage wrap for the cord and special steel mounting stake especially designed to support the decoy against the force of the string pull. The motion you need in a small, portable and affordable package. I bought this last year and used this year. It made 5 toms come in hot and ready to fight. I love it.